and love being able to personalize stamps that I can use over and over again (or even just once for a special project). When we visited the PNW earlier this year, I took bunches and bunches of pictures. I recently printed a couple hundred of my favorites so that I could get started on making some scrapbook pages and filling up picture frames and albums, and to be honest, I got intimidated looking at that stack of prints. All I’ve done is fill up a little brag book and one collage frame. I started thinking though, about making a big ol’ album of our trip. Since I love the look of repeating elements that tie everything together, I made a postmark-y looking stamp (using the 2 3/8″ round block & Times New Roman font in 25 point) that says, “Pacific Northwest Vacation – June 25 – July 5, 09” to use. I’m really happy with it and how it looked on my first finished page. and a little close-up. I stamped over the corner and around this cute A Muse image that I picked up while in Seattle. 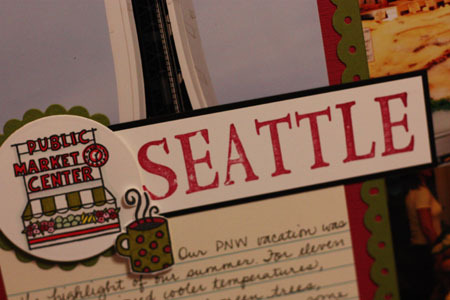 I added SEATTLE to my page using Times New Roman in 95 point and the Horizontal Wood Stamper Set. Now that I have a little mental plan goin’ on and some stamps that I know will look good together, I think I just might do some scrapbooking this weekend! Beautiful you did a great job using the stamps. This is soooooo cool Jenn, what a fabulous idea and a special way to remember your vacation!!! Great job using the stamps. Great ideas too! What a super-cool way of tying many pages together! You are such a clever girl!! I love how you used the font around the amuse stamp. The photos are gorgeous. You should definitely do some more scrapbooking this weekend! What a gorgeous page! I LOVE how you’ve done the semi circle sentiment. Fonts are SO GREAT for scrappers! I love your idea for stamping the corner – very different. Love how you used the fonts! Great scrap page! Love how this all came together. Geat job. Your layout is beautiful. Makes me want to go there. Very cute, and a great way to tie it all together. You sound like me, “I just printed off a few hundred of my favorite pictures” lol…Your page is perfect in every way!! Great inspirational ideas! Thank you, I’m off to try them out! Nice layout of a scrapbook page. Thanks for sharing your idea. great LO! I love how you used all the stamps. WOW Jenn!!! What an awesome page (and a lovely pic of you I might add) Really cool use of the stamp…thanks for the fab inspiration! What a great idea and wonderful page, Jenn — loe the postmark you created! Nice job on your page. Wonderful pictures. Thanks! Gorgeous page! I love the semi circle sentiment! Very nice! what an awesome idea for the corner sentiment. I love it. Great idea on the use of these fonts. Beautiful page. Clever idea on the corner. FANTABULOUS!!!! LOVE this page- and the PNW! Great page Jenn!! So wonderful to be able to personalize them! Very nice layout. Love your use of the JustRite stamps. You are very creative. THANKS FOR SHARING ANOTHER GREAT IDEA ON YOUR BLOG!!!! Great idea – thanks for sharing. PS Loved the photo of the needle! Wow…love what you’ve done with JR stamps. The title really pops! This page is fantastic! I love how you used the stamps! What a neat idea ! Thanks so much for sharing. Ohhh..I so love your layout and the way you used those fonts!!! Love that little corner of “Pacific Northwest Vacation”…what a smart use! What a great page….thanks for sharing your ideas…. Great idea for a scrapbook page. I like how you only used part of the stamp in the bottom corner. Sometimes less is more! I love using JRS on my scrapbooks! Cool idea! This will be an awesome scrapbook! Very creative Jenn. Love your work. YOU have inspired to get going on that closet full of scrapbooking pictures waiting for me! LOVE your page and will be using your idea of setting a stamp to use on many pages. Take good care, Jenn! Lovely page. I love the images and how they tie in together. Thanks for sharing. Gorgeous page and great idea for JR stamps. Nice work. tfs and for participating in this fun JRS blog hop. This is such a beautiful page! Love the pictures all on one side, very nice! Beautiful page. The stamps make it great fun. That would be wonderful to add any words you wanted! I’m in the middle of a vacation scrapbook as we speak so I’m happy to see some ideas for scrapbook pages not just cards. Great idea to stamp a partial circle. I love fonts too. Great scrap book page ideas! I also love the particial circle idea! I just love how you used this on a sb page… what an inspiration to us! I like the way you used the fonts on a scrap page. God bless! Great way to tie it together! Clever way to use the Justrite Stampers! Great use of different sizes of letters! I want to go to Seattle! LOL! thank you for showing the versatility of these stamps on a scrapbook page! goes to show what a true value they are! Great project, too! Thanks for sharing! That is a super cute page, great job!!! What an awesome way to tie pages together in your scrapbooks! I make scrapbooks for my kids & grandkids, so this will even work great to make all of the albums tie together even though I use different colors. My daughter has a dog training business, so this will really make her individual albums look even more professional. Great gift for the clients! This is darling. I love seeing the layouts using the fonts. Great inspiration. Very clever! I love seeing all the different ideas with the stamp sets. Clever way to personalize your memories! Thanks for sharing! Great job i like this!!! !Greetings from finland. i love that you stamped “pacific northwest” around your space needle. cute. Hey Jenn – I love this and the stamp in the corner was great. Wonderful layout. awesome layout…my daughter wants to know if there really is a wheedle on the needle? I love the way you show the versatility of these stamps. I’ll have to look for these Amuse images when I visit my son and DIL in the PNW. Good luck with the scrapbooking! Wonderful page and thanks for showing uses for the stamps! Great job. I like the partial corner sentiment. I never thought of doing that, but it’s perfect. Love this layout and great use of the fonts. Love how you used the font around the stamp…so clever. Beautiful scrapbook page. Love the scrapbook page. I can see where these fonts would come in very handy for me. What a great idea – I have used something similar on layouts before. Thanks for reminding me of that. I haven’t scrapbooked in ages. Maybe this will motivate me! A great way to make use of the Font sets from JR. Happy Scrapbooking! I love how you incorporate stamping into your scrapbooking. What a great layout Jenn. Great use of the fonts. Wow, this is a very good use of these stamps. I love the semi circle effect on your page. It’s been so much fun visiting all the site and seeing the clever things all of you designers have done. Thanks for sharing. Beautiful work. This blog hop has been fantastic. eeek! what a great way to use the stamp and alphas! thanks for the inspiration! Great scrapbook page and wonderful use of the stamps. great page – and so much easier than using ms word to do words in a circle! WOW Jenn!!! What a great way to personalize the layout! LOVE the use of fonts and also your handwriting is awesome! mine is so scrawly – can’t wait to use some JR on my layouts!!! Lovely page! Great job of using stamps for titles and journaling on a great scrapbook layout. Very creative … Love your page. Be strong, you can get those pages done in no time, now that you have a plan. Just don’t look at the stack of photos as a burden. Look at those JR stamps and fonts and see what and where you can go with them. I like the creative idea of stamping in the corner of the page. Love how you used only part of the stamp in the corner of the journaling element. 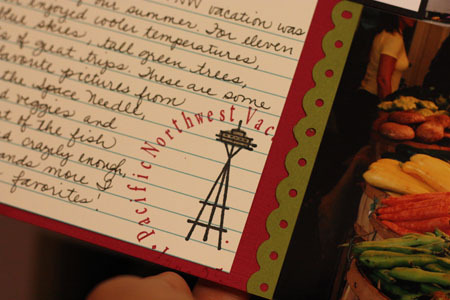 I love your idea of doing the “postmark” of the vacation theme and the days you went. We went on a Pacific Northwest trip this year also, but I can think of many other trips that ware waiting to be scrapped that I could use this idea on. Love the layout! The fonts make a beautiful addition. Wow, what a great scrapbook page. I love what you did with everything. Great!!! Loved your creative use of fonts! I’m inspired! Love your scrap book pages and what a great job using the font sets with your pages! Now this is thinking outside of the box uhhhh I mean circle! Thank you for showing me how to use these directly on my scrapbook pages. The postmark theme is great. It’s awesome that you were able to find a stamp to match your main image. It will tie everything from this adventure together wonderfully. Great creativity. Great design to your page!! Love it Jenn! A fabulous scrapbook page! It’s a beautiful picture of you, you are so photogenic girl! Just gorgeous, gorgeous, gorgeous! Thanks for sharing your great design! Another GREAT page and I like how you used the Just Rite font. neat idea! Nice layout by the way! Very cool! Love how you stamped around the image. What a great page – I love how you used the fonts. Thanks for sharing with us. What a great page – thanks for sharing! Wow – what a wonderful scrap page – love the use of the fonts! I usually think of Justrite for cards, but you showed how they can be used in scrapbooking as well. Great! Great scrapbook page. I like how you’ll use the same image throughout your pages to tie it all together. Great idea. Really nice scrapbook pages. The images you used and the justrite tools you used were “just rite”. Great use of stamps on scrapbook pages. You’ve inspired many people today. Love it–love Seattle–haven’t been to the market in so long. Your layout transformed me from cozy den to downtown with all the sights and smells. Great job in being able to transform someone. Great idea!! Thanks so much for sharing!! I love the various ways you used the Just Rites in your pages. Very nice. Great LO. You must have had a really fun time to take so many pictures. Love your layout. 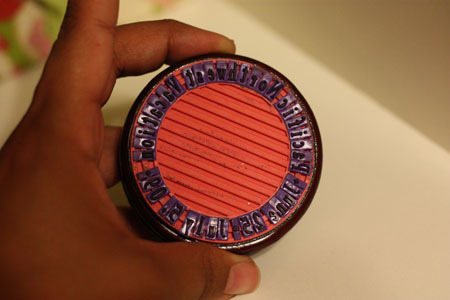 Great ideas for using the stamps and fonts in ways that I would not have thought of. Your page turned out great. How creative…these stamps are so versitle. Oh my goodness, what a great way to use these stamps in my scrapbooks. Wonderful use of the fonts on your scrapbook page! TFS! I ADORE your scrappy page and your incorporation of the fonts! Too cool and love the way you used the stamps! Nice to find these individual messages work as well on scrapbook pages as they do on cards. What a wonderful page you have done!! good layout. You make it look fun and somewhat easy. Love how you used the just rite to do the northwest vacation in the corner, great idea. Beautifuk page. Thanks for sharing. What a great page layout. I like this kind of look in scrapbooking and to be able to personalize it with Just Right…how fun. Gorgeous! Perfect layout! Wonderful creativity! TFS! thanks for sharing…I hadn’t thought of using these on my scrapbook pages but I will be looking for ways to incorporate them now! Great project! Love the lay-out and how you added that circle element in the corner. TFS! Great page. Thanks for the ideas. Great to see a scrapbook idea…love your page. What a fantastic page, Jenn!! Wonderful and creative uses for the JustRite Fonts, and I love all of your photos too!! I love seeing these stamps used on scrapbook layouts – thanks for sharing! You did such a wonderful job on your scrapbook page and I love the ideas with the JustRite stamps. That is brilliant Jenn! Love your idea! Really nice work! Thanks for sharing your ideas! Great projects! I just may NEED the horizontal stamper after seeing your projects! Lovely projects Jen. These fonts lend themselves to all projects, they are so versatile.tfs. Nice job and love the page layout. Love your layout and how you did the corner on it too. 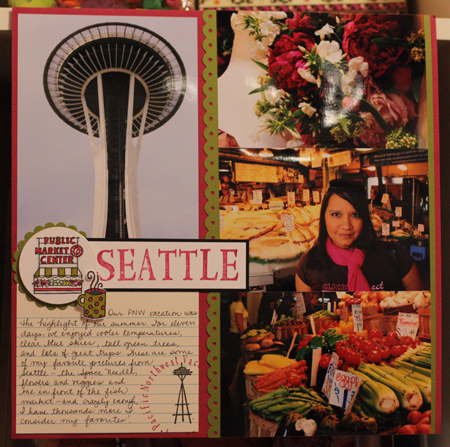 Phyllis M.
What a great Seattle page- it really captures the flavor of it all! Nice to see how you used the fonts on a Layout instead of a card! Thanks for these great pages! Thanks for the great ideas on how to incorporate these stamps into scrapbook pages! I have to try it! Great job using the fonts in your scrapbook journaling. Love your LO and the way you used the stamp in corner. Thanks for the inspiration. What a great layout! The corner stamp is so great! Those stamps look so versatile. Really makes the project look classy. I never thought to use the circle to make scrapbook elements- thanks for the idea!